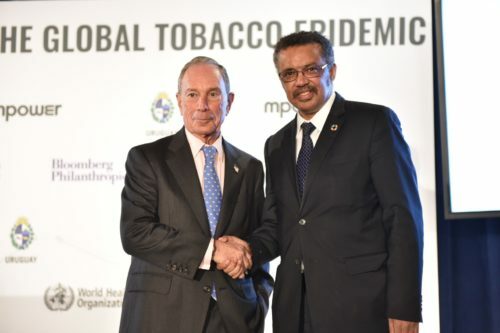 Mike Bloomberg and the WHO DG launching the Bloomberg-funded report on the Global Tobacco Epidemic 2017. An unsurfaced conflict of interest? We’ve sent a letter to WHO and the FCTC secretariat in advance of FCTC COP-8 (1-6 October, Geneva) – protesting about WHO’s inclination towards prohibition and excessive regulation of alternative nicotine delivery systems (ANDS). For background, see papers on vaping (FCTC/COP/8/10) and heated tobacco products and others (FCTC/COP/8/8). The letter by David Abrams, Ray Niaura, David Sweanor and me is available in PDF form with all footnotes here – and the text is reproduced without notes below. As academics and experts in the field of tobacco control (see page 6), we are concerned by the apparent support of WHO and the FCTC Secretariat for outright bans or over-regulation of low-risk alternatives to smoking. These low-risk products include e-cigarettes and other vaping products, heated tobacco products, modern smokeless tobacco and novel nicotine products. These products, collectively known as Alternative Nicotine Delivery Systems (ANDS), form the basis for the public health strategy of ‘tobacco harm reduction’. They have one factor in common: they do not involve burning of tobacco leaf or smoke inhalation. It is smoke that causes the overwhelming burden of disease and there is no serious doubt that non-combustible products are far less harmful than cigarettes. We have also seen no compelling evidence that these products attract significant numbers of young people who would not otherwise have smoked. Claims of ‘gateway effects’ have invariably suffered from methodological weaknesses . Regular youth use is concentrated in young people who smoke and there is evidence that young people use vaping products to reduce harm and to quit smoking. Youth smoking has fallen unusually rapidly in the United States in recent years even as youth vaping has increased. We see no evidence that vaping ‘normalises’ smoking. As expected, it appears to do the opposite by promoting alternatives to smoking, thereby normalising smoking cessation. Millions of smokers have moved from cigarettes to less harmful alternatives where the laws allow it. Where ANDS have been popular, we have seen rapid declines in adult smoking, for example in the United Kingdom, Sweden, the United States, and in Japan where cigarette consumption fell by 27 percent in the two years between first quarter 2016 and the same period in 2018 following the introduction of heated tobacco products. That is a remarkable result that should engage everyone concerned with tobacco control and tackling non-communicable disease. But many have ignored it. Margaret Chan, the WHO’s director-general, expressed concern and urged caution. “E-cigarettes will prompt young people to take up smoking. I recommend that national governments ban, or at least regulate, them,” she said. We have since seen WHO and the FCTC secretariat embrace the concept of prohibition, for example in briefing materials for FCTC COP-7 in 2016 as if this policy is the norm or a default option. This WHO stance was subject to very strong and well-founded expert criticism. In the papers for COP-8 to be held in October this year, we were disappointed to see more emphasis on ENDS prohibition, with repeated references to bans or applying the same regulation to the most harmful products, cigarettes. The position taken towards ANDS continues to be negative and unbalanced (see, for example, paragraph 27 and 28 of the COP-8 paper on ENDS 19), which stress only risks but never opportunities and call for policies that would be the same as applied to cigarettes. In the case of heated tobacco products (HTPs), WHO describes all tobacco products as “harmful” without recognition that the difference in risk between tobacco products spans two orders of magnitude. All forms of tobacco use are harmful, including HTPs. Tobacco is inherently toxic and contains carcinogens even in its natural form. Therefore, HTPs should be subject to policy and regulatory measures applied to all other tobacco products, in line with the WHO Framework Convention on Tobacco Control (WHO FCTC). This assertion makes no sense: why should regulators take an undifferentiated approach to the riskiness of the product when health risk is the primary purpose of regulation and the risks differ dramatically between different products? Yet the statements of WHO have influenced countries such as India, with 104 million smokers, to adopt policies that promote prohibition and aim to deny these low-risk options to its citizens. There are now 30 countries that ban these products19. Given that many millions of smokers are now, as a matter of policy, deliberately discouraged from or denied the opportunity to switch from cigarettes to low-risk products, who will assume responsibility for those who continue to smoke, and perhaps die, as a result? Will the World Health Organisation accept this responsibility? Though the goalposts have shifted to 2030 and a less precise target, it is important to ask if anything has been learnt from the likely impending failure to meet the 2025 goal? Tobacco harm reduction would have made a difference: it is an important tool to address the epidemic of smoking-related disease and the overall burden of non-communicable disease. If WHO is serious about its role in achieving this goal, it should recognise that the fastest way to reduce premature mortality by 2030 is by smoking cessation among adult smokers by whatever means works. The strategy of tobacco harm reduction through use of ANDS is one of the most promising ways to achieve smoking cessation, precisely because it is so popular with smokers and requires a smaller, more manageable change of behaviour than necessary to achieve complete abstinence, yet with almost the same health benefits. The Royal College of Physicians has highlighted how excessively burdensome regulation (including prohibition) applied to ANDS such as e-cigarettes can actually lead to more smoking. However, if [a risk averse, precautionary] approach also makes e-cigarettes less easily accessible, less palatable or acceptable, more expensive, less consumer friendly or pharmacologically less effective, or inhibits innovation and development of new and improved products, then it causes harm by perpetuating smoking. Getting this balance right is difficult. E-cigarettes present an opportunity to significantly accelerate already declining smoking rates, and thereby tackle one of the largest causes of death in the UK today. […] There should be a shift to a more risk-proportionate regulatory environment; where regulations, advertising rules and tax duties reflect the evidence of the relative harms of the various e-cigarette and tobacco products available. The highest taxes on cigarettes but lower tax or no tax on low-risk products, with tax differentials reflecting the likely difference in risk. Complete bans on promotion of cigarettes, but controls on content, target audience and placement of promotion for ANDS (given these function as smoking cessation adverts). Strong graphic health warnings and plain packaging for cigarettes, but for ANDS proportionate warnings about nicotine backed by clear communication of the comparative risks of smoking. Legally-mandated bans on smoking in enclosed public places, but policy on ANDS use would remain the responsibility of owners or managers of public places. Product regulation of cigarettes focussed on reducing aspects of product appeal, but prudent regulation via product standards to improve and standardise ANDS safety and quality. Public health agencies to give realistic information about risk and quitting smoking, not simply campaign to reduce ANDS use whatever the impact on smoking. In your capacity as Director General and the most influential leader in global public health, we hope you will make a statement calling for an open mind about the potential for new technologies and innovations that can help people stop smoking. We hope you will insist on impartial expert advice and assessments to guide policy. We hope you will urge caution on those jurisdictions considering prohibition or excessive regulation of ANDS and remind them to take responsibility for the likely harmful unintended consequences of policies that deny smokers options to quit smoking. Finally, we would welcome an opportunity to meet with you and appropriate members of your team to discuss these issues and the proper approach for WHO in more depth. Please let us know if this would be possible. The authors declare no conflicts of interest with respect to tobacco, vaping or pharmaceutical industries and confirm that no issues arise with respect to FCTC Article 5.3. Dr. David B. Abrams is Professor, Department of Social and Behavioral Science NYU College of Global Public Health New York University. USA. He directed the Office of Behavioral and Social Sciences Research (OBSSR), National Institutes of Health. He has published over 280 peer-reviewed articles, is Principal Investigator on numerous NIH grants and served on the Board of Scientific Advisors of the National Cancer Institute. Dr. Abrams was President of the Society for Behavioral Medicine and recipient of their Distinguished Scientist, Research Mentorship and Service Awards; received the Cullen Memorial Award, American Society for Preventive Oncology for lifetime contributions to tobacco control; Research Laureate Award, American Academy of Health Behavior; and the Distinguished Alumni Award, Rutgers University.He authored the award-winning: The Tobacco Dependence Treatment Handbook: A Guide to Best Practices. His current focus is health promotion in populations and nicotine use from basic science to prevention, treatment, public health and health care practice, to policy. Clive D. Bates is Director of Counterfactual, a consulting and advocacy practice focussed on a pragmatic approach to sustainability and public health. He has had a diverse career in the public, private and not-for-profit sectors. He started out with the IT company, IBM, then switched career to work in the environment movement. From 1997-2003 he was Director of Action on Smoking and Health (UK), campaigning to reduce the harms caused by tobacco. From 2000, he was closely involved in the development of the Framework Convention on Tobacco Control as head of a leading non-profit tobacco control organisation and was instrumental in the establishment of the Framework Convention Alliance of supportive NGOs. In 2003, he joined Prime Minister Blair’s Strategy Unit as a senior UK civil servant and worked in senior roles in government and regulators, and for the United Nations in Sudan. He started Counterfactual in 2013. Dr. Raymond S. Niaura is Professor, Department of Social and Behavioral Science NYU College of Global Public Health New York University. USA. He is a psychologist and an expert on tobacco dependence and treatment, as well as substance use and addiction to alcohol. For eight years, Dr. Niaura was the Director of Science and Training at the Schroeder Institute (SI) for Tobacco Research and Policy Studies at the Truth Initiative. Dr. Niaura has previously taught and conducted research at Brown University, Johns Hopkins Bloomberg School of Public Health, the Georgetown Medical Center, and the School of Public Health at University of Maryland. He was also a former President of the Society for Research on Nicotine and Tobacco and is a Deputy Editor of the journal Nicotine and Tobacco Research. Dr. Niaura has published over 400 peer-reviewed articles and book chapters. David T. Sweanor JD is Adjunct Professor of Law and Chair of the Advisory Board of the Centre for Health Law, Policy and Ethics at the University of Ottawa. He has worked on global tobacco and health issues for more than 30 years, helping set many global precedents in Canada. He has also worked globally on tobacco issues with the WHO, PAHO, World Bank and numerous other bodies and spoken and published widely.. His interests extend to a wide range of topics, and in addition to his personal work he funds numerous initiatives. He was the recipient of the Outstanding Individual Philanthropist award for Ottawa in 2016. * Note: that Bloomberg-funded report is here and confirmation funded by Bloomberg here. Not that it needs saying that WHO has a conflict of interest with Bloomberg – what if Bloomberg opposed things that are in the public interest and in the interest of public health? This is the way to go! Good job!